You may well have purchased the very best quality coffee beans in the entire world but how you grind them before you brew your coffee makes a huge difference to the end result. If you’re going to grind your own beans at home, make sure you invest in a premium coffee grinder. If you run your own café or coffee shop, you definitely need to consider the best type of coffee grinder especially if you want your customers to keep returning! Before you rush out to buy a coffee grinder, you need to think carefully about the type of coffee grinder you need because there are different grinders. The Baratza Encore gives a magnificent grind for drip/manual brew and also grinds fine enough for espresso. It’s reliable, very easy to clean and maintain grinder, perfect for every espresso lover. Capresso 560.01 is compact, easy to clean, simple to use and is the best grinder we’ve found in its price range, performing better on fine grind settings than coarse ones. A fabulous day begins with a delicious cup of coffee and excellent coffee starts with the perfect grind. KRUPS GX5000 burr grinder is the perfect middle ground for the coffee lover who is searching for a fully functional grinder at a decent price. Breville BCG820BSSXL is a stainless steel conical burrs designed to minimize grinding heat and protect the essential oils in the coffee bean, a bit pricey but the perfect coffee is priceless. Designed for the amazing performance and reliability, the KitchenAid KCG0702OB Burr Grinder uses stainless steel burrs to grind coffee consistently at any of the 15 possible grind levels. For those insistent on a hand grinder, the Hario Skerton was best in its class for speed, portability, and ease of grinding. The main difference between each is how the beans are ground down, some are ground down by hand, some are ground down by blade and some spin causing the beans to break up. In this piece, we will explore the top types of coffee grinders so you know which is right for you. First things first, while you need to grind your coffee beans to make coffee, the way you decide to grind your coffee beans will always make difference to the end flavor. Particles that are uneven will release different quantities of oil and this alters the end aroma. Heat also changes the coffee flavor. Remember, grinding coffee is a laborious process that creates heat, however, too much heat and you run the risk of damaging your end coffee flavour so you shouldn’t set any automatic grinder to the highest setting. It’s also worth reminding you that making decent coffee takes time, there’s no need to rush it! The manual grinders tend to work by using a handle, placed at the side. Automatic grinders have a mechanical button and they do the job quickly. They’re usually good for large quantities as they can cope with more beans at once. However, that doesn’t mean they’re right for you, particularly if you only want one or two cups of coffee! Don’t be tempted to grind your coffee beans in advance. For a great tasting cup of flavoursome coffee, you should grind your coffee a couple of minutes before you brew. Otherwise, you run the risk of your coffee going stale. That’s because as soon as coffee beans hit the air, they start the oxidisation process. So, only grind the beans that you need and keep the remaining beans tightly sealed in a plastic container, stored in a cupboard away from sunlight. The crusher coffee bean grinder is the most basic grinder you can buy and is usually very cheap. It uses something that resembles a larger mortar and pestle. It’s entirely manual, meaning you crush the coffee beans against the mortar using the pestle. While this process grinds down coffee beans, it does sometimes leave large, uneven pieces and it is a little messy so you might want to consider the others. An automatic blade grinder finely grinds beans using a sharp, spinning blade. This action reduces the particles until they are fine enough to produce delicious tasting coffee. Depending on the quality of blade grinder you choose, you’ll find that some of the pieces don’t grind themselves down to very small particles, this is essential if you want a really good cup of coffee. The other grinder available is called a burr grinder and this is the best type of coffee bean grinder you can buy to produce real quality coffee. Generally, a burr grinder produces consistent size pieces which create a far superior flavour coffee and if you buy a top of the range burr grinder you can easily adjust the size of particles desired as well as the speed of your grinder giving you more scope (for example, if you want Turkish coffee, you’ll want extra fine particles). The burr grinder has sharp plates inside it that trap the coffee beans and grind them down until they are very, very small. The speed settings are important as the slower the speed, the less heat created so saving that extraordinary coffee aroma that everyone loves. 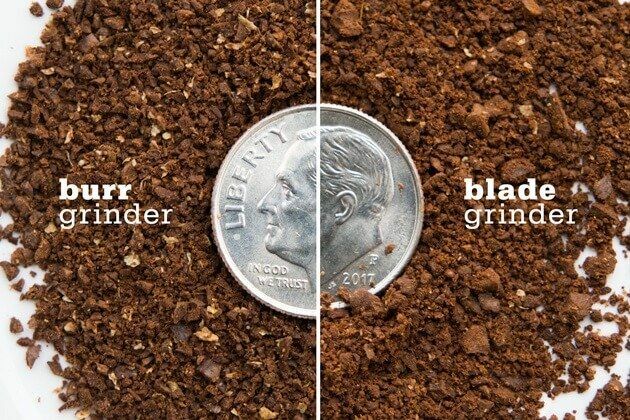 Delve deeper into burr grinders and you’ll find the best one to buy is known as a conical burr. This is because these types of burr grinders give you real freedom to control the size of particles you create as well as allowing you to set the required speed. Do note that conical burr grinders can be fairly noisy but they do the job well because they reduce coffee beans into minuscule pieces, vital for that fabulous coffee drink you want to achieve! Burr coffee grinders aren’t as difficult to clean as you might imagine. When you do buy your burr grinder, invest in a special brush that gets rid of any excess coffee grinds left over (the store you purchase from should stock them). As a tip, look for a clear glass burr too because then you can keep an eye on your coffee beans while they’re grinding down. This helps you to see when they’re ready to go. You can buy burr grinders with a timer which lets you know when the job’s done so you can get on with other things. Some of them come with a useful auto shut-off mechanism. If you are going to make an investment in a burr grinder, try and avoid cheap models. If you’re a real coffee enthusiast you won’t mind spending some extra money on this important piece of equipment. There’s nothing better than getting up in the morning, grinding beans for a truly fresh, intense cup of coffee.